Fairytale Brownies is giving its Facebook fans the opportunity to share photos of their pets captured in a Fairytale moment as part of the gourmet brownie company’s Fairytale Furry Tale Contest. Fairytale's Furry Tale Contest First Prize winner will receive a Photo Tin Bar Sprite & Cookie Combo. This month, Fairytale Brownies is giving its Facebook fans the opportunity to share photos of their pets captured in a Fairytale moment as part of the gourmet brownie company’s Fairytale Furry Tale Contest. From June 4-13, anyone who likes the Fairytale Brownies Facebook page and fills out the entry form will be entered to win one of three gourmet brownie prizes. Each prize will have the winner’s pet photo printed on the gift lid or band. Fairytale Brownies introduced the photo upload option in January as part of its keepsake gift line, and the idea has become quite popular. 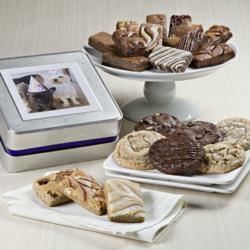 First prize for the contest is a Photo Keepsake Tin filled with Fairytale Sprites, Fairytale Cookies and Fairytale Bars. Second prize is a Photo Morsel 24 and third prize is a Photo Morsel Dozen. The judges will select five finalists from the entries. From those five, Fairytale fans will be allowed to vote once a day from June 17-19. The top three winners will be announced on June 20. ABOUT FAIRYTALE BROWNIES: The mail-order company has been baking gourmet brownies since 1992. Every batch is made by hand using a secret family recipe. The brownies, cookies and bars are all natural, baked with the finest ingredients such as imported Belgian dark chocolate, farm fresh eggs, pure creamery butter, and dark brown sugar. Each brownie, cookie and bar is individually wrapped and certified kosher dairy.